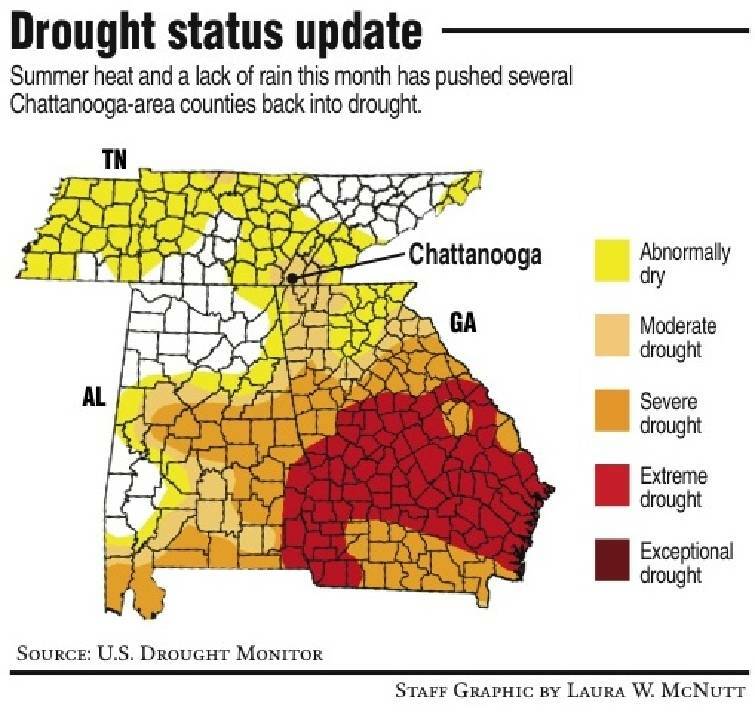 If cloudless skies, crunching dry grass and wilted flowers weren't enough of an indication, it's official -- drought has returned to Chattanooga. The U.S. Drought Monitor released a report Thursday morning with a swath of "moderate drought" extending through Northwest Georgia into parts of several Southeast Tennessee counties. Chattanooga has seen only 0.01 inches of rain since July 30, according to data from the National Weather Service. "If it isn't a record, it's a No. 2 because you can't get any less than zero," said Paul Barys, senior meteorologist at WRCB. While all of the counties in the Chattanooga area are classified as at least "abnormally dry," the new drought classification includes all of Hamilton, Bradley, Catoosa, Whitfield and Murray counties. It also includes parts of Walker, Dade, Marion and Sequatchie counties. Meteorologists at the National Weather Service Office in Morristown, Tenn., said it doesn't appear likely that the region will get any spin-off storms from Hurricane Irene in the Atlantic. A high-pressure system is to blame for pushing away any chance of rain over the last month, said Derek Eisentrout, a meteorological technician in Morristown. "High pressure has been dominant over the Southeast," he said. Barys said there's no end in sight. "I don't see anything [rain] around here for two weeks," he said.